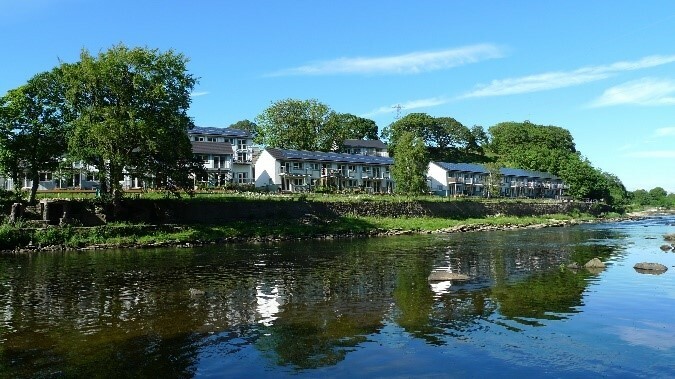 Forgebank is an eco cohousing development consisting of 35 leasehold homes (a mixture of two and three bedroomed houses), shared buildings, low carbon workspace and riverside woodland habitat. Planned and designed by the residents with architects Eco Arc and local building firm Whittles Construction, the first residents moved in in 2013. The aim of the founder members was to encourage informal social contact whilst preserving individual space. The houses include the features of any modern conventional home, but they are clustered around a common house and other communal facilities, including a laundry, communal post boxes and guest rooms. The common house contains a communal kitchen and dining room where members regularly cook meals for each other. Forgebank residents are members of Lancaster Cohousing, actively participating in the day to day running of the community, including managing communal finances, maintenance, gardening, cooking, and cleaning. Houses face onto a pedestrian street, and car use is much lower than average with limited car parking at the edge of the site, the group operating a community car club, vehicle and lift sharing and extensive bicycle facilities. The homes were designed to Passivhaus standard and meet Code 6 for Sustainable homes. Heating and hot water come from a district heating system powered by a single biomass boiler, run on local woodchip. Energy use for these is about 15% that of average UK homes. With energy efficient appliances and lighting reducing electricity usage to about 30% of average homes, electricity is generated from two community energy schemes – a 89 kWp array of solar PV panels owned by Morecambe Bay Renewables and a 160kW hydro electric scheme, Halton Lune Hydro, just upstream. The neighbouring Halton Mill also provides 1,000 m 2 of rentable workspace in a former engineering works, eco renovated to improve air tightness and insulation. 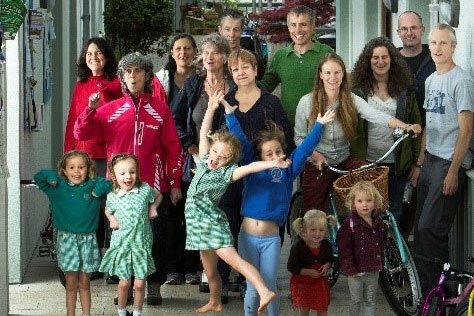 Also run as a co-operative, it applies the philosophy of cohousing to the workplace, containing private and shared workshops, studios and offices rentable on a long-term or ‘hot-desk’ basis. It attracts small enterprises, freelancers and artists from the local area, with Lancaster Cohousing residents eligible for a discount to encourage reduced commuter miles. Life with Polly, 5, and Isla, 3, when my partner works away a lot is more fun and easier in cohousing. We enjoy healthy cooked meals everyday yet I only cook one less than once a fortnight, and informal childcare swaps free up some time too. We socialise everyday with other children and adults without my having to organise playdates, pack a bag or tidy the house. Polly can visit friends independently down the pedestrian street, and Isla has a safe space to ride her bike and scooter. When the girls fall asleep I don’t need a babysitter, or to travel to enjoy a quick glass of wine with friends.